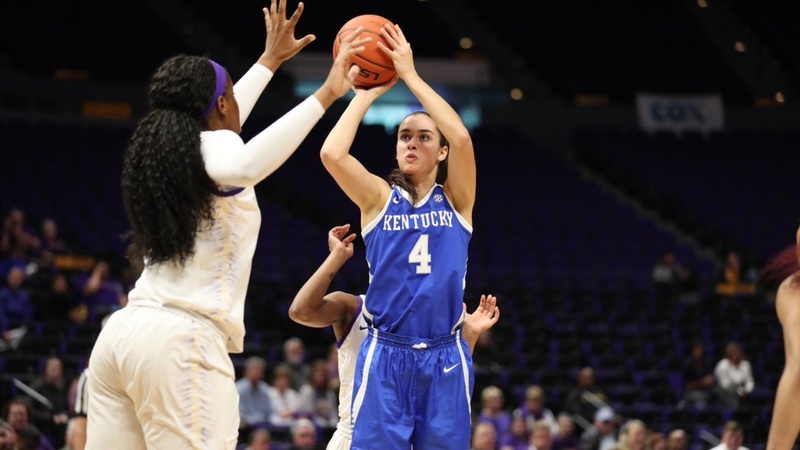 The University of Kentucky Women’s basketball team headed down to Baton Rouge, LA on Thursday night to take on the LSU Tigers after suffering a home loss to Ole Miss over the weekend. The Cats headed into the game welcoming back Senior, Maci Morris, but would be without star Freshman, Rhyne Howard and Senior leader, Taylor Murray. It was going to take a full team effort to pull off the victory. Despite the odds being stacked against them, Kentucky got the group effort they were hoping for. Maci Morris carried Kentucky with 20 points and five rebounds, moving her to 9th place on the UK career scoring list with 1,515 points. The game winner was hit by Keke McKinney with 20 seconds left in the game. The score was tied at 60-60 and McKinney knocked down a big three pointer to give the Cats a 63-60 advantage. She would later add a free-throw to seal the win, 64-60. Kentucky made their first 4 shots of the game and built a 9-2 lead. As LSU would miss six in a row from the field, Kentucky would stretch the lead to 13-2. The Wildcats would extend the lead even more to 21-5 before LSU would hit three consecutive three-pointers to cut the lead to 21-14 at the end of the first quarter. Morris and freshman, Blair Green both had six points to lead the Cats early. Both teams struggled to score at the beginning of the second quarter. LSU would finally score to cut the lead to five. Kentucky got a basket from Morris to answer and extend the lead back to seven. LSU cut the lead to one and Kentucky got a huge three pointer and extended the lead 26-22. The Tigers came back to hit one of two at the line before Morris buried a three. The Cats forced a turnover and got a basket from McKinney just before the end of the half. Kentucky would lead 31-25 going into the break and Morris lead the way with 11 points. The teams played evenly early in the third quarter scoring nine points each. The Wildcats would lead by as many as eight on three different occasions, but LSU would score the final five points to cut the lead 50-48. Tatyana Wyatt had a big third quarter for the Cats, scoring seven points, while Morris had five of her own. Kentucky scored the first two points of the fourth quarter on a basket by Ogechi Anyagaligbo but LSU would score the next four points to tie the game at 52-52, the first tie of the game. After Morris gave Kentucky a 54-52 lead, LSU would score four points to take a 56-54 lead, their first lead of the game. But a free throw by Morris and a layup by Roper gave Kentucky back the lead. Jaida Roper was fouled and connected on a pair of free throws giving Kentucky a 59-56 lead with a minute and a half to play. With under a minute to go, LSU tied the game at 60. Then came McKinney’s time to shine. She drained a three-pointer and knocked down one of two free throws late to seal the victory for the Cats, 64-60. Kentucky returns to action as they host Missouri at home nextThursday. Tip-off is set for 6:30 p.m. ET and you can watch it on the SEC Network.